A big thanks to Dani from the website For the Love of Wonder for contributing this article. Although Uganda is roughly 85% Christian, Kampala has a wonderful variety of cathedrals, mosques, temples, and churches to explore. We hopped on two boda bodas and took the entire day touring Kampala and these spectacular places of worship. We were warmly welcomed in some places and firmly turned away at others, but I suppose that’s all part of the adventure. We even had more places on our list that we weren’t able to get to in one day, so keep your eye out for a possible part two of Kampala’s places of worship! We had a very pleasant experience at Kampala’s largest mosque. Upon arrival, I greeted a woman with the Arabic greeting as-salaam-alaikum (peace be with you) and, assuming I was a Muslim, she didn’t charge me the standard 10,000 shillings for the tour! 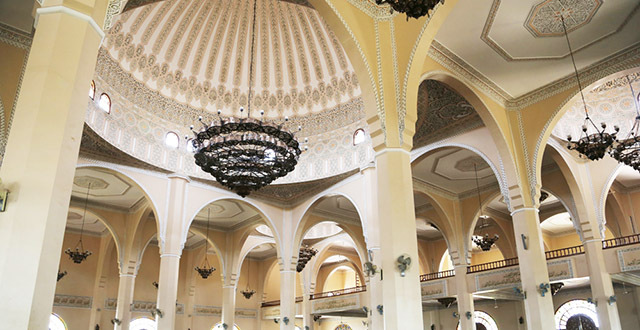 We were led to the stunning interior of the mosque, where we sat and talked with a wonderfully friendly man named Ashiraf who told us about the history of the mosque, which was gifted to the Uganda Muslim population by the late President of Libya, Muammar Gadaffi. He answered all of our questions and let us visit the place for as long as we’d like. We then walked the many steps to the top of the minaret – a must if you visit or live in Kampala! It is absolutely the best view of the whole city! Unfortunately, the next hill over, at Namirembe Cathedral, we had a bit of a negative experience. They are doing renovations inside, so they refused to let us enter. We then asked if we could just walk around it and they agreed, but the woman insisted on following us, as if she didn’t trust us. We stopped in front of a door that was open and as I lifted my camera to take a picture of the stained glass windows, the woman barked at me, telling me it was “out of bounds.” We certainly did not feel welcome there, so we took a quick look at the cemetery, which certainly has a lot to offer in terms if history, and we moved on quickly. 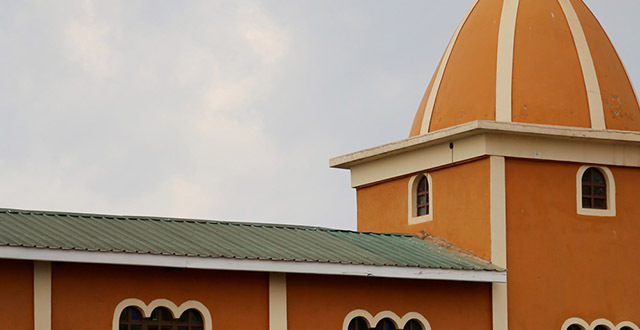 Namirembe Cathedral is the oldest in Uganda and was built in 1890. 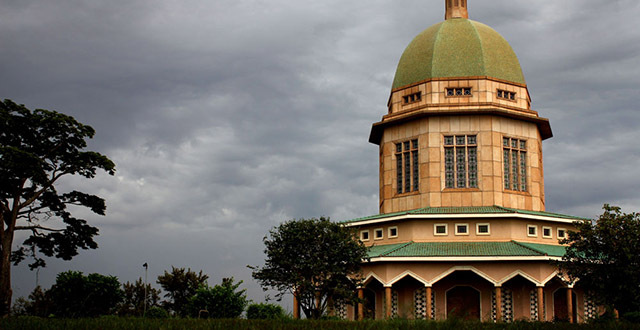 It represents a lot of history for the Church of Uganda and still acts as its central office. 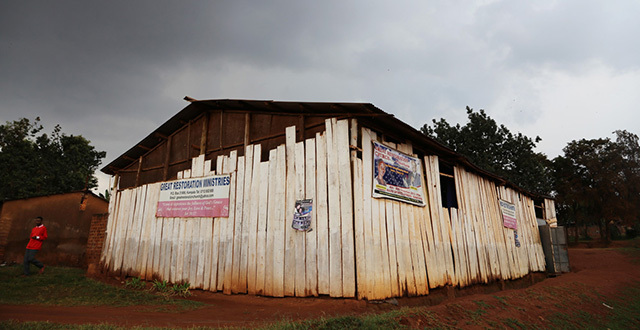 With all this touring of Kampala’s religious sites, I thought we should at least see one local church without all the glitz and glam. I directed our bodas to a place in Makerere Kikoni to this humble place of worship, which I’m sure has just as much energy pouring out of it on Sundays than any other church in Uganda. I had visited this church a few years ago with another friend when my curiosity was piqued after spotting it on the top of Lubya hill. At the time, they apathetically let us walk around the outside, but didn’t allow us to enter. It was a shame that this time, upon arrival, Teri and I were turned around at the gate. I tried to convince the guard to let us see the place, telling him he may be turning away angels, but he insisted that he was not allowed to let in either Westerners or even Ugandans. Evidently, this is a place only for Eritreans and Ethiopians. He invited us to come back on Sunday during their service, but I have a hunch we wouldn’t be too welcome then, either. Knowing little about the Hindu religion and its various sects, I hoped we could pick up on a few basics at Kampala’s different Hindu temples. We didn’t see anyone around this one, but the guards let us know that we could freely tour the place, so we took the liberty to explore its interior and exterior, eventually finding steps that led us out to the roof. We took several photos all around without seeing hardly anyone. 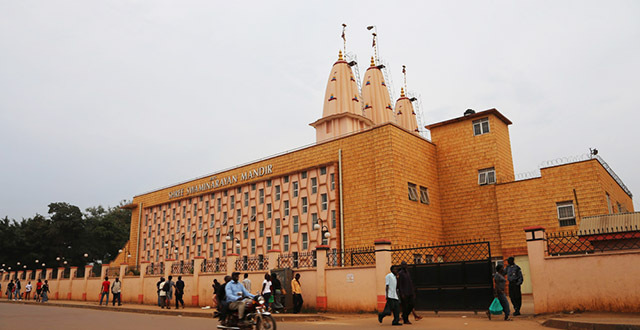 Next, we stopped at another Hindu temple downtown Kampala. Here, we met a very kind woman named Hima who warmly invited us to take photos, ask any questions, and even come back for their service and a dinner on Saturday. Admittedly, I didn’t even know enough to begin asking questions, so I only asked the difference between their beliefs and those of the last temple we visited. She remarked that this sect of Hinduism believed in only one god while the other worshiped many different gods. We may return on Saturday to learn more! 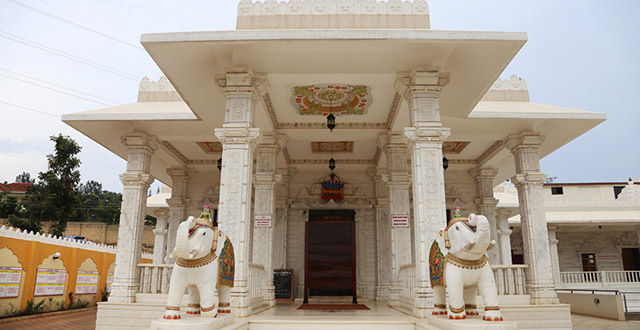 Jainism is an ancient religion in India, which, from my understanding, precedes Hinduism. 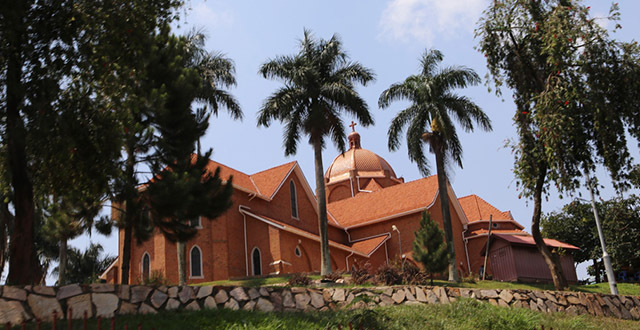 This temple was just finished last year, situated in Naguru hill, and, in my opinion, tops the list as the most beautiful temple in Kampala. The priest came out to welcome us and told us they imported the marble from India to build this temple. His pride in this stunning place was evident and we were very welcome to look around and ask questions. Our tour ended on a sad note as we rolled up to the entrance of the Baha’i temple and found the gates locked. Visiting hours ended at 5:30 and we were just a little late. I had visited this temple many times before, however, so I cheated and used a photo for this post from a previous visit! Baha’i is one of the world’s youngest religions and its followers believe that all messengers of the world’s major religions are messengers of God and their messages all point to the same God. It is a very unifying and peaceful religion with one major temple on each continent. Kampala is lucky to host its African temple!